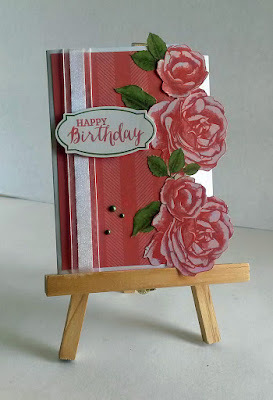 One of the first things I ordered from the new annual catalog -- even before it went live on June 1 -- was the Petal Garden Designer Series Paper, pictured on the very top of page 187. I just thought the colors were so fresh and yummy. When I received the delivery, I was so disappointed in this stack. 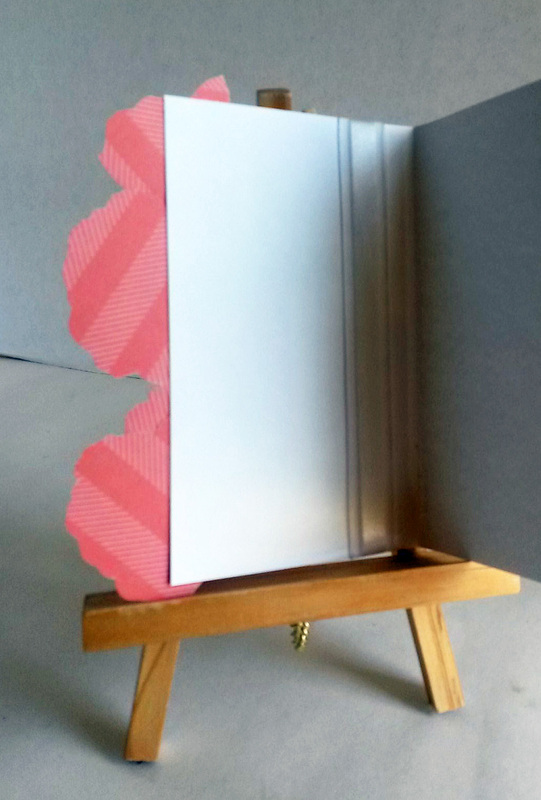 After flipping through the 48 pages of the 12 designs, I was completely disenchanted. 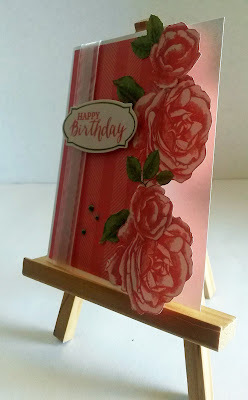 I set the stack aside, figuring I'd never use the papers, especially the prominently printed ones. The subtle prints on the back sides would possibly be a little easier to use. 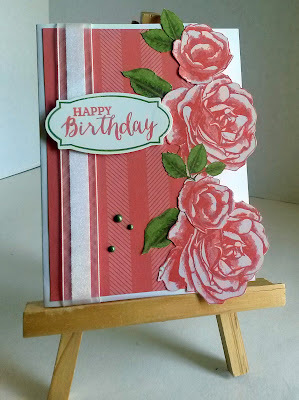 I think one of the things that I disliked the most was the roses against the background they were on. Suddenly I had a revelation. I figured out a way to save these lovely roses. 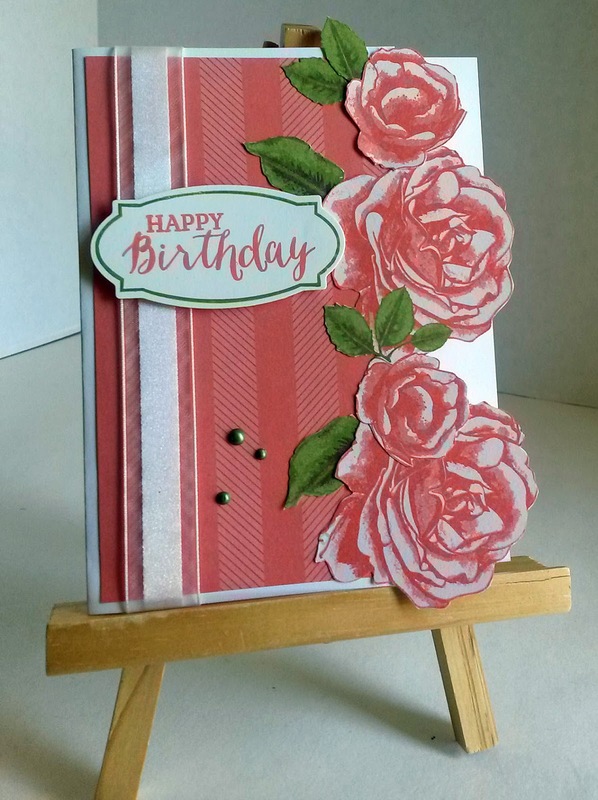 FUSSY CUT THEM! So I did. 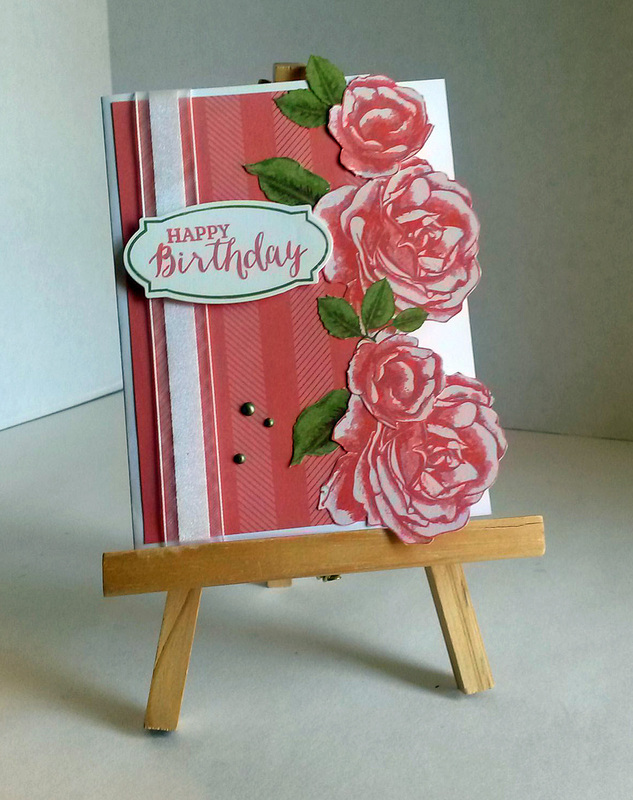 Do you notice how the fussy cut pieces extend beyond the top and bottom of the card? 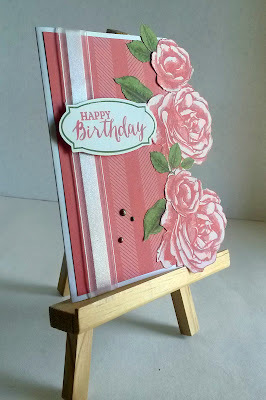 Because of this, if I want to mail the card, I will need to get out my trusty Envelope Punch Board to make a custom envelope to fit it perfectly. No problem. I don't know if I'll be wishing anyone a Happy Birthday with this card anytime soon. Right now, it is just sitting close by so I can admire it and be happy that I was able to rescue those roses! 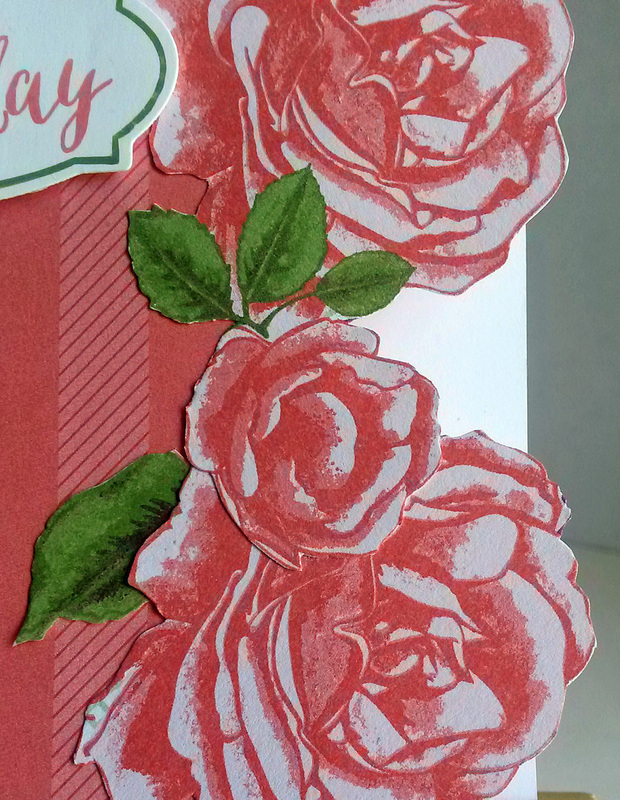 Here are a couple of close-ups of the fussy cut roses. I know the lighting in this photo is fairly odd. 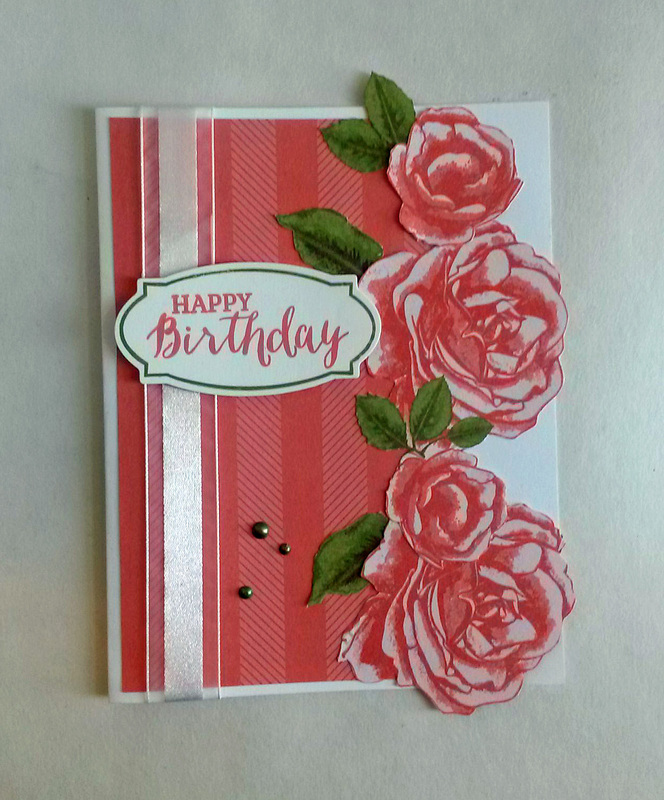 But I wanted to put it at an angle so you could see how the cut roses are set apart from the back side of the card. And the roses themselves were facing away from the sun. The photo below shows the card opened and lying facedown. The following photo specifically shows how the rosy edge of the card looks away from the back layer. 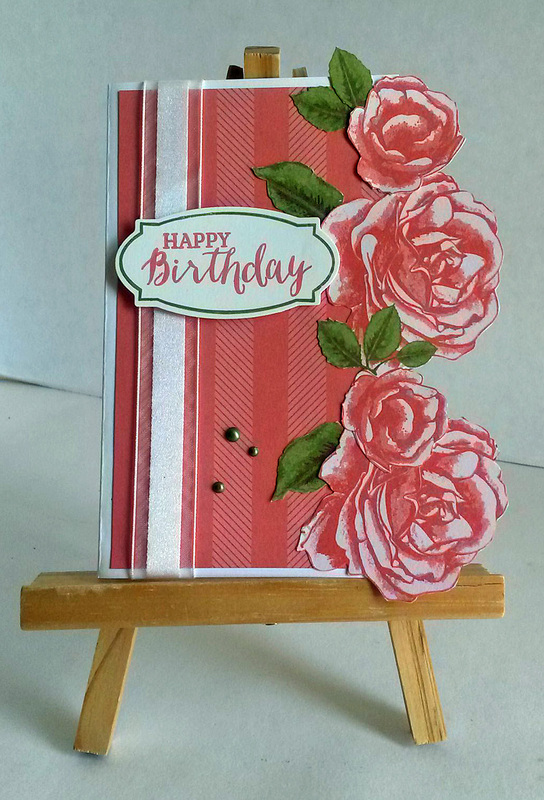 Notice that the DSP I used for the rest of the card front is the reverse side of the roses. 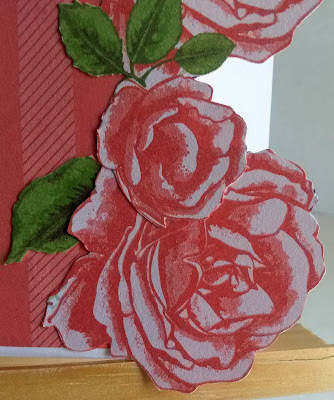 Below you can see how I attached the roses to the card front, which I cut to 3 1/4" instead of the standard 4 1/4". It's probably not the most attractive . . . 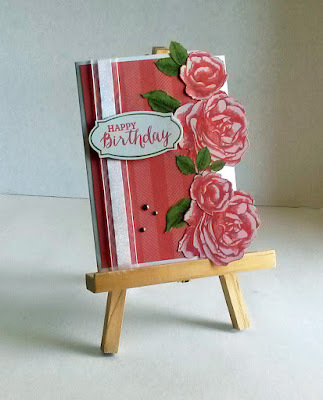 But I didn't feel like doing any more fussy cutting, which is what I would have had to do to make it look beautiful. 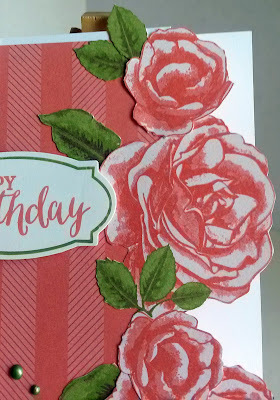 I would have placed Whisper White on the backs of the roses, but in order for it to work, the white would also have had to be fussy cut. This is fine. 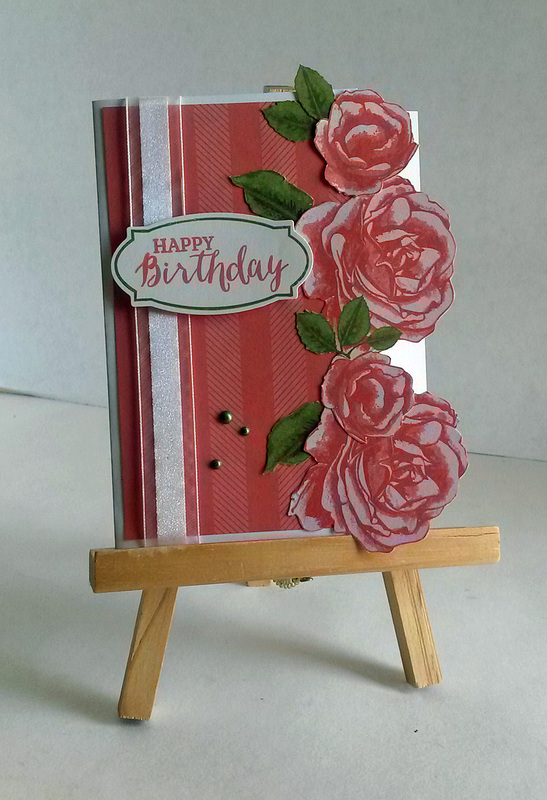 The birthday sentiment is stamped in Calypso Coral and Old Olive to match the colors in the DSP. The sentiment and frame around it are from the Rose Wonder stamp set (page 162), while the frame was die cut with the matching Rose Garden Thinlits on page 216. 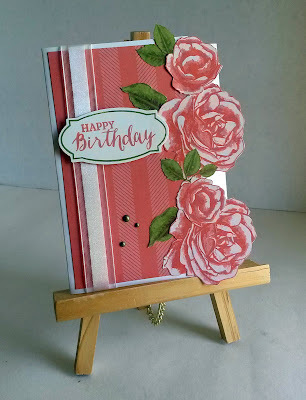 Turned at an angle to spotlight how the rosy edge looks. Aw, why not? 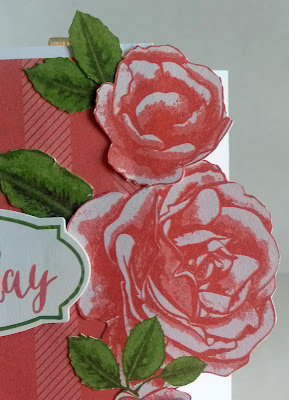 a few more close-ups of the fussy-cut roses. 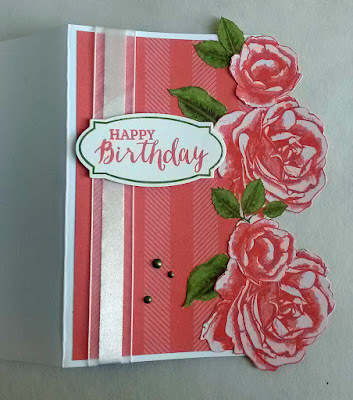 Aren't they just lovely? 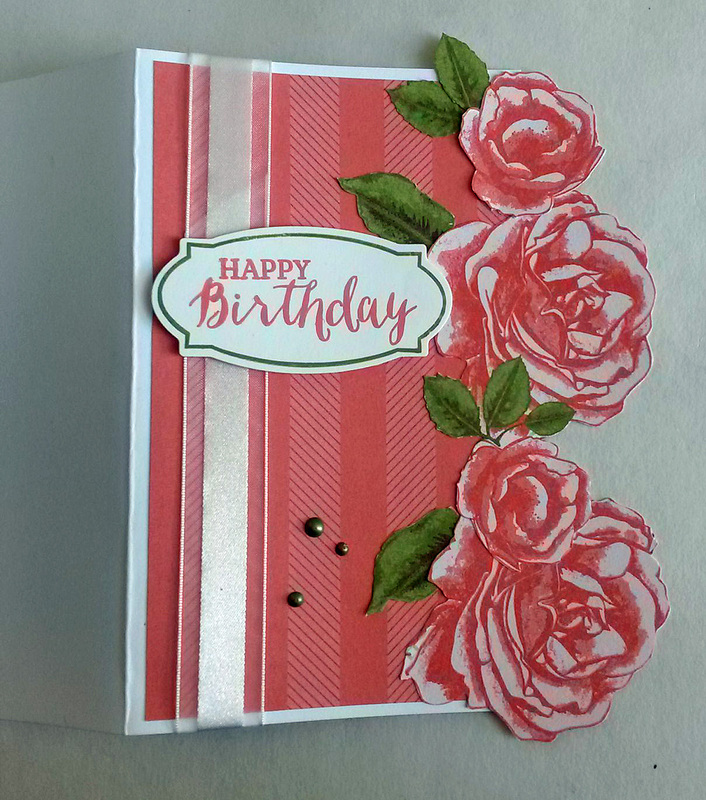 The addition of little green Nuvo Drops embellishments gives the card the perfect finishing touch. I make a bunch of these little add-ons to keep on hand for projects. Ah! Now I'm in love with the Petal Garden DSP Stack. I have discovered how to make a silk purse out of a sow's ear -- so to speak. Has that ever happened to you? You get all excited in the anticipation of a new product. Then it arrives and you are less than enchanted. You shrug in disappointment, only to tuck the item away. 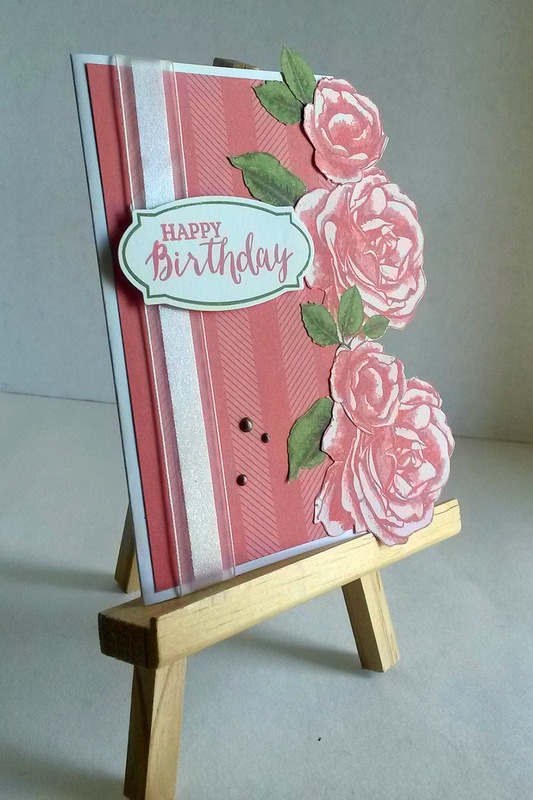 Well, before you tuck something away permanently, give yourself the chance to think outside the box, and see what other ways you can come up with to use something you'd originally thought unacceptable. Thank you Linda for sharing at #overthemoon link party. 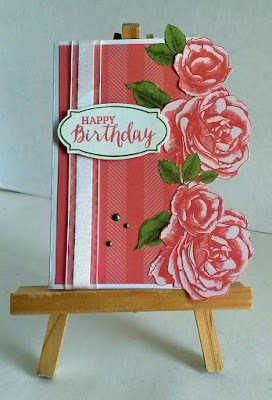 This is such a beautiful birthday card and I love roses. those roses are absolutely stunning! Thanks for sharing with SYC. great idea and very inventive.